The West Hollywood Planning Commission on Thursday will consider whether to approve a controversial five-story project on Norton Avenue that will replace 21 rent stabilized housing units with 34 units, five for low- and moderate-income people and 29 that will be sold as condominiums. The project, developed by Craig Berberian’s Empire Property Group, was approved by the Commission’s Urban Design Subcommittee with the proviso that changes be made to make it appear less bulky. It would sit on three lots one occupied by two one-story structures with a total of six apartments, another with a one-story structure with a one-story and a two-story building with a total of seven apartments and the third lot with a two-story building with eight apartments. Rent increases for all 21 apartments are governed by the city’s rent stabilization law. The property is at 8017-8029 Norton, a block north of Santa Monica Boulevard. In 2008 the City Council granted an appeal by local residents to reject a plan to replace 13 apartments on two lots at 8017-8023 Norton with a 16-unit condominium building. Council members argued that the design was mediocre and did not provide adequate parking. The current project includes 61 parking spaces, three more than the 58 required for a building of its size under city law. In a petition signed by 30 residents and at a meeting in May at which the project was presented by the developer, neighbors objected to the size of the building. The building crosses two different zoning areas, one of which permits a building of no more than three stories and the other of which permits a four-story building. Because it is offering housing for low- and moderate-income people, Empire is asking for permission to add one more story to each side of the building, making it a combination of four and five stories. In their petition to the city, opponents of the project argued that it would be out of character with the neighborhood. “Norton Avenue is made up of I story bungalows, some of which can be considered historic, as well as small 2 story apartment complexes,” the petition says. “The proposed … condominium complex … completely out of proportion to ALL of the buildings in the area, TOWERING over them by at least 3 stories. lt is one MAMMOTH strncture spanning three lots, and does not fit in with the California Courtyard style that is prevalent throughout the neighborhood. “It is removing 21 UNITS OF AFFORDABLE HOUSING for working, middle class, West Hollywood residents and replacing it with 5 affordable housing units- FOR A NET LOSS OF 16 AFFORDABLE UNITS FOR WEST HOLLYWOOD RESIDENTS,” the petition says. The commission’s hearing will be the latest in a series of meetings before it and the City Council at which residents and political figures have debated the impact of denser development on the quality of life in West Hollywood. Supports of more development have pointed to its economic benefit to the city and to the fact that building more housing is likely to lower housing costs over time. Opponents contest the impact of more housing on housing costs, citing relatively high rents at several new apartment buildings. They also object that such buildings might harm their quality of life by creating more traffic and making parking more difficult to find. The commission also will consider on Thursday a proposal to demolish a single-family rental unit and a four unit-apartment building at 948-950 San Vicente Blvd. and an eight-unit apartment building at 954 San Vicente Blvd and replace them with a four-story, 18-unit apartment building over a subterranean parking garage. The building would include three on-site units for low- and moderate-income people. The commission will meet at 6:30 p.m. Thursday at the City Council Chambers, 625 N. San Vicente Blvd. south of Santa Monica. Thanks to the efforts of Victor Omelczenko and others, the necessary signatures were collected and an appeal was presented to the city regarding the 8017-8023 Norton Avenue project. The appeal essentially requests a thorough traffic and environmental impact study, as well as downsizing the project. A huge 5-story building is simply not compatible with the established neighborhood of mainly 1 and 2 story mid century structures. Folks, the appeal to downsize this project can be become a reality. Plans for a downsized building project at 826 N. Kings Road have been proposed following discussions by a citizens group (United Neighbors for Responsible Development) with the city and the developer. In fact, there is a meeting scheduled for Thursday, October 1st, 6:30pm at 625 N. San Vicente Blvd. to discuss the new plan. It would be great if folks from the Norton Ave neighborhood show up for this meeting to lend support, as this is the very thing that we are trying to do with the Norton project. The WeHo Planning Commission folks, in their infinite wisdom (NOT! ), have since approved this abomination. However, the fight is NOT over! A petition for an appeal has been generated, the necessary number of signatures acquired and it has been presented to the City. 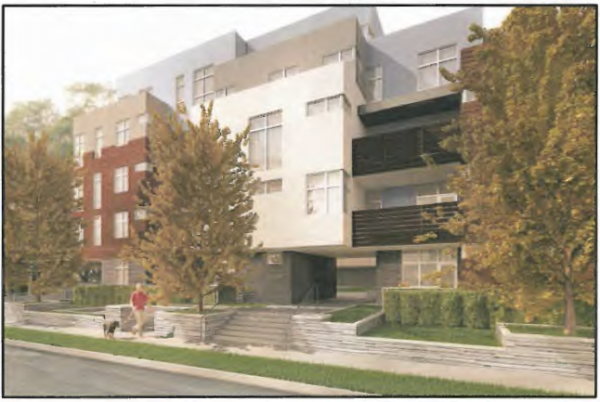 Essentially, the appeal calls for downsizing of this project, as it is hardly compatible with an established neighborhood consisting of mainly 1 and 2 story buildings. This will stick out like a brown thumb monstrosity. Furthermore, it is requested that THOROUGH environmental impact and traffic studies be conducted. Traffic is already a major issue with drivers from Crescent Heights using Norton and Laurel Avenues as an alternate to reach destinations north of the area. Parking has been an ongoing problem, even though most buildings have parking areas. Unless this project has adequate subterranean parking for both tenants and guests, it will just compound the parking problem. There are numerous reasons that this proposed building is unacceptable. While the design and massing might be suitable for a main boulevard, it is unsuitable for the scale of Norton, a small side street of low key ambiance. The design violates the spirit of neighborhood compatibility as did another proposed project located at 7914 Norton which I successfully appealed to the City Council in 2011. The 7914 Project evolved into a three story Spanish Colonial Revival inspired design rather than the original offensive four story oversized box grafted on another box. The architect of this project is capable of more thoughtful design. West Hollywood not only needs outstanding architecture appropriate to our “highly desirable city” location but it needs architecture of high value sympathetic to the context of the neighborhoods. Grafting behemoths onto the streetscapes because they pencil out profitably for the developer is not the answer. The neighborhood sustains a permanent loss as do the unnecessarily displaced residents. To remove 21 rent stabilized units is morally offensive and can be avoided with thoughtful refurbishment of existing housing stock. What a perfectly horrendous idea! I don’t see how anyone can claim to be in favor of affordable housing and permit this project that blatantly decimates our affordable housing stock. What will happen to the 21 families and tenants in the current existing units? Welcome to the real WeHo 2.0. This is just a preview of the next decade folks. Interesting that all the “Housing Rights Activists” who have espoused their point of view on the Kings Rd and Beverly Blvd projects have been silent on this. Taking away 21 rent stabilized units to create multi-million dollar condos flies in the face of affordable housing – where is their outcry about how “affordable housing is at the very heart of West Hollywood”? There are seniors and disabled community members who live in these buildings on Norton – what are they suppose to do, get on the City’s housing list with thousands of other people? I’m all for updated housing but this is not cool. You can’t take away affordable only to replace with a net loss. Now that’s BullSh*t and needs to be stopped. Dead. In. It’s. Tracks. The Planning Commission (aka Demolition Committee) is either in cahoots with these demolitoner-developers or just blind to the fact that while always crying about the real lack of affordable housing they keep allowing existing affordable housing to be demolished, uprooting longstanding rental tenants replaced by expensive condos (with the “poor floor,” as in former ICM Beverly Blvd. building, and other so-called “affordable” units crammed into the corners of each new luxury building, the Commissioners apparently relieving themselves of their deserved social guilt with this fake “affordable” insertion). On my block alone, two 2-unit/2-bedroom beautiful single floor 1920s units are being demolished, evictions in force, for “luxury” housing no one here needs. Add the documented confluence of the mega-corporatized Vacation Rental business to this tear-down mentality and we have the perfect storm of displacement of community and loss of any sense of common humanity. One need not be a “believer” or agree with the Catholic Church’s other social positions to accept as true, the Social Justice wisdom — on this precise issue as quoted here below — of the current Pope. 93. Whether believers or not, we are agreed today that the earth is essentially a shared inheritance, whose fruits are meant to benefit everyone. For believers, this becomes a question of fidelity to the Creator, since God created the world for everyone. Hence every ecological approach needs to incorporate a social perspective which takes into account the fundamental rights of the poor and the underprivileged. The principle of the subordination of private property to the universal destination of goods, and thus the right of everyone to their use, is a golden rule of social conduct and “the first principle of the whole ethical and social order”. The Christian tradition has never recognized the right to private property as absolute or inviolable, and has stressed the social purpose of all forms of private property. Saint John Paul II forcefully reaffirmed this teaching, stating that “God gave the earth to the whole human race for the sustenance of all its members, without excluding or favouring anyone”. These are strong words. He noted that “a type of development which did not respect and promote human rights – personal and social, economic and political, including the rights of nations and of peoples – would not be really worthy of man”. He clearly explained that “the Church does indeed defend the legitimate right to private property, but she also teaches no less clearly that there is always a social mortgage on all private property, in order that goods may serve the general purpose that God gave them”. Consequently, he maintained, “it is not in accord with God’s plan that this gift be used in such a way that its benefits favour only a few”. This calls into serious question the unjust habits of a part of humanity. 94. The rich and the poor have equal dignity, for “the Lord is the maker of them all” (Prov 22:2). “He himself made both small and great” (Wis 6:7), and “he makes his sun rise on the evil and on the good” (Mt 5:45). This has practical consequences, such as those pointed out by the bishops of Paraguay: “Every campesino has a natural right to possess a reasonable allotment of land where he can establish his home, work for subsistence of his family and a secure life. This right must be guaranteed so that its exercise is not illusory but real. That means that apart from the ownership of property, rural people must have access to means of technical education, credit, insurance, and markets”. 95. The natural environment is a collective good, the patrimony of all humanity and the responsibility of everyone. If we make something our own, it is only to administer it for the good of all. If we do not, we burden our consciences with the weight of having denied the existence of others. That is why the New Zealand bishops asked what the commandment “Thou shall not kill” means when “twenty percent of the world’s population consumes resources at a rate that robs the poor nations and future generations of what they need to survive”. Looking at this NEW design changes made by the Planning Board’s Joint Opinions and settled on their agreed compromise is SERIOUSLY much more IMPOSING and less set back than the first rendering. The first rendering Looks unquestionable better, attractive, more symmetrical in a Traditional Building Concept that styles change, and building to the current taste of the moment, will look dated before construction is finished and will look really dated and unattractive 10-20-30 years increasingly over the decades. Why should we (the city and it’s funds/assets, residents who pay normal tax and other city costs, and land owners in weho) PAY FOR ANYONE’S housing needs WHO IS NOT NOW AN EXISTING WEHO RESIDENT. The Low Income Units go into the weho housing trust fund, and is open to ANYBODY – no weho residential requirement. Also, the entire applying for and wait list is a closely held secret (I would like an open transparent, fair list making sure the people the city gov’t of weho has pledged to serve NOT people living outside weho …. They have the City of LA and all their own massive housing issues and programs. They do not (and should not) care about the social funding by city governments for people outside thier city and jurisdiction. This is not some harsh or selfish belief. This is one small number of new low income housing units in the greater 11 million plus greater los angeles area of people living, all with their own issues and have the same other county/state/federal/private charitable funded resources for their low income housing needs. The nominal number of weho units relative to the greater LA area is NOT nominal to the people barely getting by NOW living in weho with rents exceeding their low income living. Who are all these people so vehemently FOR the weho and their religious devotion like call to arms for more low income units??? On this site, they are most likely the LAST person to need low income financial housing assistance. It all benefits the money developers running weho, and which this blog and the regular commenters routinely make mocking rejections to normal opinions that there is nothing wrong with all the money and building now steamrolling through weho. Calling anyone who has a legitimate concern about a project next to or on their block as “JUST WHINING NIMBY’s WHO’S COMPLAINING HAS NO MERIT” .. when the locals are the ones affected, and when given noticed by law, it is proper and should be the most important voices heard by planning commission. “NIMBY” is not a derogatory term nor does it make these people so labelled by the regulars here as really “less than equal and rather worthless to being of bad character’ But the same regulars on this less than objective “news” source just make the same offensive dismissive rejection of any and everyone not 100% in line with what the City’s Plans and actions are made. I think it’s interesting they ask to build higher because, by law, they have to offer affordable housing. That’s the rules. If they don’t like the zoning and the law…they can build their project elsewhere. Why do we have to keep making exceptions for every developer? So in 5 years..the building next to them will be torn down and those developers will ask the same exception. Just one story taller, etc. It has to stop. Another blow to affordable housing. I hope they disapprove this project, but we all know they will approve it, maybe with small changes. More rent controlled housing lost. This is a regular happening in the Planning Comm. More condos, less rent controlled apartments. West Hollywood is truly turning into a City for the moneyed class.